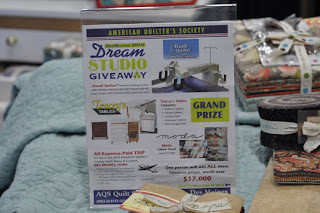 Dream Studio Giveaway. 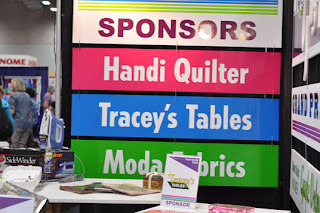 Imagine new sewing tables, new machine and over 3,000 of moda to stock your room! 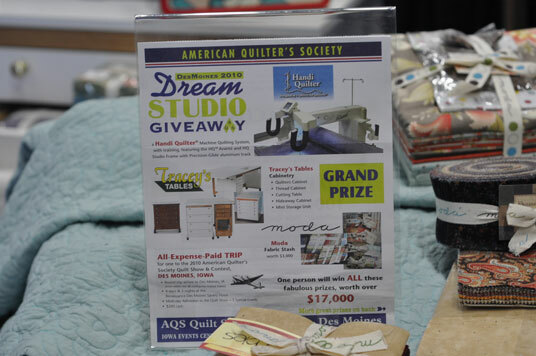 Des Moines is the home of Better Homes & Gardens, American Patchwork & Quilting, Quilts & More, All People Quilt website, Quilt Sampler, and many many more of your favorite titles. Jennifer and Meredith handing out "I Love Fabric." pins. 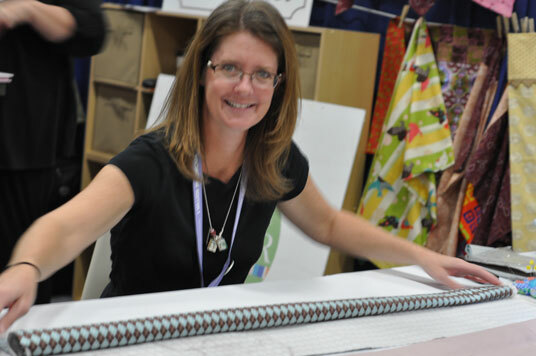 I am sure they ran out because who doesn't love fabric. 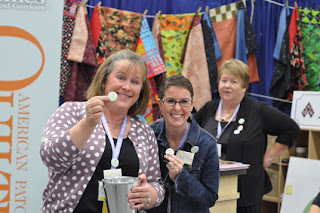 Of course the Million Pillowcase challenge was in full force. Brenda Lesch was busy prepping the pillowcases to be sewn. 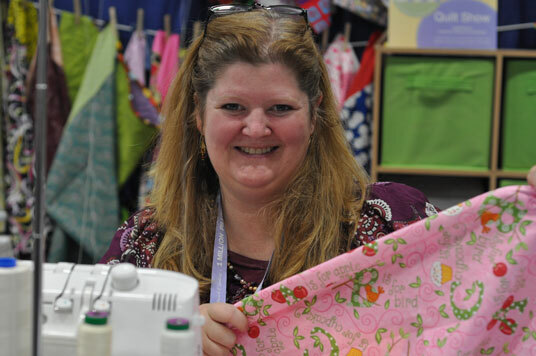 Jodi sewing away on a pillowcase. (opps, look it, happens to be a moda fabric) Love that Deb Strain. 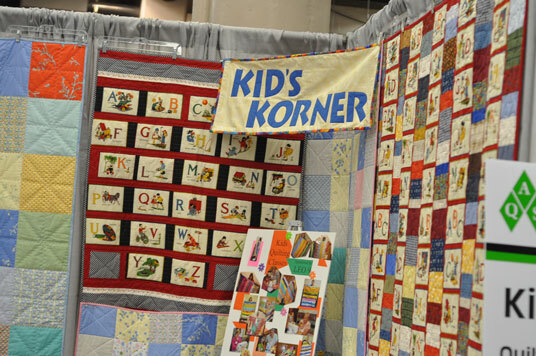 The Des Moines quilt show also had a Kid's Korner. Moda was a sponsor of this event. The display consisted of quilts from the State Fair 2010. 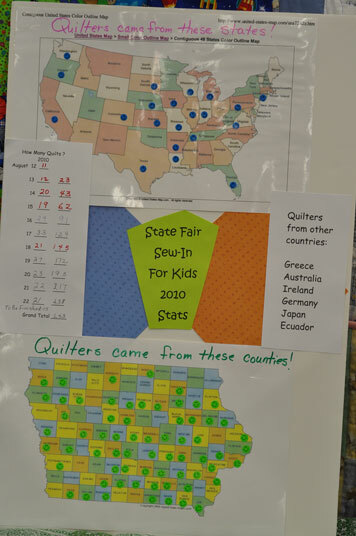 Here is an impressive graphic showing how many different states were represented at the state fair. 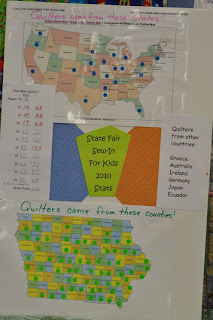 They even had quilters from Greece, Australia, Ireland, Germany, Japan and Ecuador. 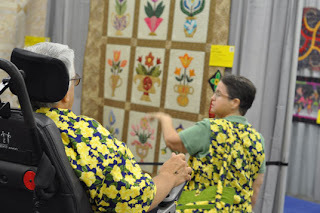 This was the cutest couple wearing matching outfits. Quilting is the greatest "sport."